We only came to Alypa Bay because it was at the end of a full-day walk we planned to do, so we wanted to check out options for getting back to our car once we’d finished. 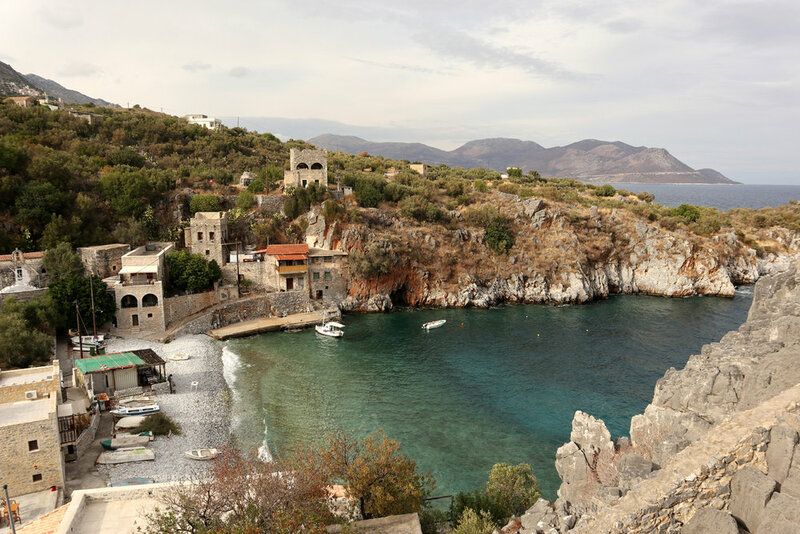 Our Peloponnese walking book describes it variously as a "pirates' cove" and a "sunken cove", neither of which is particularly accurate, though the hillsides are steep and there are a few small fishing boats in the bay. What Alypa is, however, is pretty magical - so much so that we found a room, and stayed there for five days, swimming, walking and pottering around the surrounding area. In fact, we only moved on when the lack of any internet connection began to impact on Sam's school (which is now totally online) and my work (which was needing some email activity). Which is kind of a sad reason to leave. 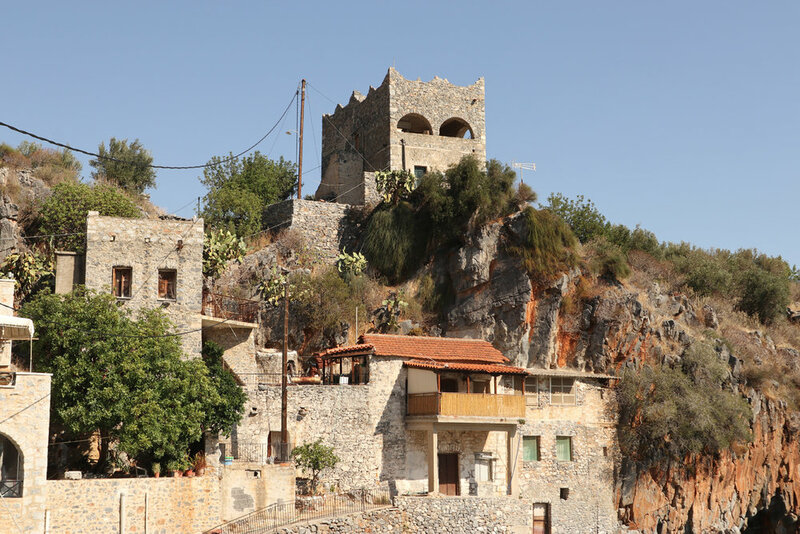 The village is tiny: a couple of dozen stone houses, several with Mani-style towers; a largish church; a small chapel, and a beach taverna with a concrete back wall and a roof cobbled together with green canvas, corrugated iron and lots of rope. The taverna menu included three fish options - small (whitebait-sized), medium (large whitebait-sized) and large (small trout-sized). The first two were fried whole and the third sliced into steaks through the backbone and also fried. All were delicious. The seven local cats would arrive with the smell of fish, so not a bone or a fish head was wasted. Sam ate chicken souvlaki and chips, with tomato sauce. There was Greek salad and a rather bitter vegetable we only tried once. Plus beer and two wine options - white or rose - both relatively revolting. Alypa is the only place we've been to in Greece where you can't drink the tap water. We ate in the taverna every evening, playing cards or dice while we waited for the food. We were always the only customers for dinner (it was late September, I suppose, and getting chilly outside), though a few other tourists turned up for lunch or drinks during the day. Our landlord in our small-room-with-terrace was Vasili, who lived round the corner and rowed out sometimes to check his nets in the bay. We never saw him wearing anything but a pair of old shorts - never a shirt, even when it got chilly in the evenings. One day he came back in his boat with a fish, which he gave to his cat, waiting for him on the beach. Vasili's aunt ran the beach taverna, with her husband. Photos on the wall of the living room, which doubled as the kitchen prep and food storage area, as well as where we went to order our food and pay our bill, showed she'd been a beauty as a young woman. Then there was a youngish-middle aged couple living in one of the houses opposite who would arrive in their small motorboat while we were having breakfast in the mornings, and unload one plastic shopping bag. Just one. She sat in the front of the boat, he stood at the back to steer. Neither wore life-jackets. We never saw them head off, and it didn't look like there was fish in the bag. Maybe they went shopping - perhaps it was easier to access the nearest shop by boat. While we were there, a younger woman moved into part of their house; a daughter maybe. There were no children in the village. In the stone house next to them was an elderly couple, who lived with a middle-aged couple (daughter and husband?) They ate all their meals on a covered deck outside, staring at the fridge (which was also on the deck) - never out at the view, and they sat out there chatting late into the night. They fed the old lady with a spoon. If you swam across the bay to the right you came to a ladder out of the water and a staircase leading enticingly up, but it only led to a firmly locked gate. I snuck past it but the only thing further on was a large fence and a more impenetrable gate. It is the Mani, after all. Tourists came to the beach to swim, but we never saw a local in the water. They didn't use the beach cafe, either, but in the early evenings the men would sit in hard chairs on the narrow main street, chatting. Just like in every town in the Peloponnese. Sometimes the aunt joined them, preparing vegetables. We shopped at the little store in Flomochori (picture above - with the bikes outside), and bought fruit and vegetables at Kotronas from a van that went round the villages. We found a funny little abandoned almost-island called Skopa, connected by a thin strip of beach to the outskirts of Kotronas. The sea was amazingly blue and you can swim off the rocks at the back and no one would know you were there.